Rizk was launched in 2016, sending Captain Rizk out in the world to entice players to join him on his casino adventure. We tried the casino in January 2019, and these are our findings. Rizk is one of the better casinos we have tried lately. They have been around for a few years and have added some great promotional tools which makes it fun for the player to keep coming back. First off, you have the leveling system where every time you level up you get a Spin on the great Wheel of Rizk where you can win Free Spins, Mega Spins, Cash or even a huge Jackpot! All free spins are Rizk are always free of wagering as well! 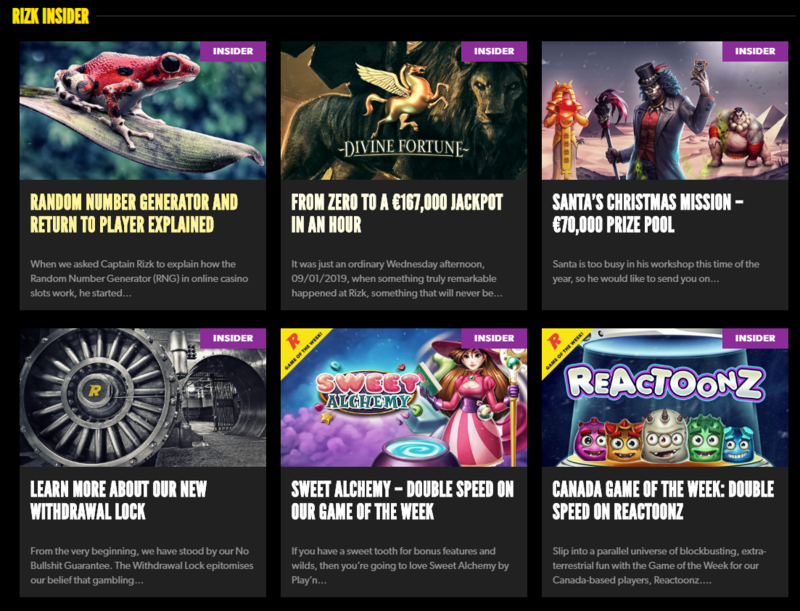 They also have a great offering of Games from a wide selection of Game Studios and other cool features. Some markets, like UK and the Scandinavian regions have slightly different welcome bonuses. Be sure to check Rizk directly to see what offer applies to your country! What about the slots offering at Rizk? Being on the iGaming Cloud platform like GUTS, they have access to a wide range of Game Studios and they make them all available for us to enjoy. More than 1000 games and plenty of Game Studios such as Yggdrasil, Quickspin, Netent, Pragmatic Play and more to keep you going. In their games lobby, they have focused on giving the game thumbnails as much space as possible and they manage to squeeze in an impressive 28 of them in view whilst still keeping them quite large. Using the game lobby is a bit cumbersome though and the amount of games in view can easily becoming intimidating and you revert to searching for a game you know instead. They do have a section where the games are split by provider, but they offer no way of filtering by provider and all the games are simply ordered by Provider, with Netent first and in no particular order after that. 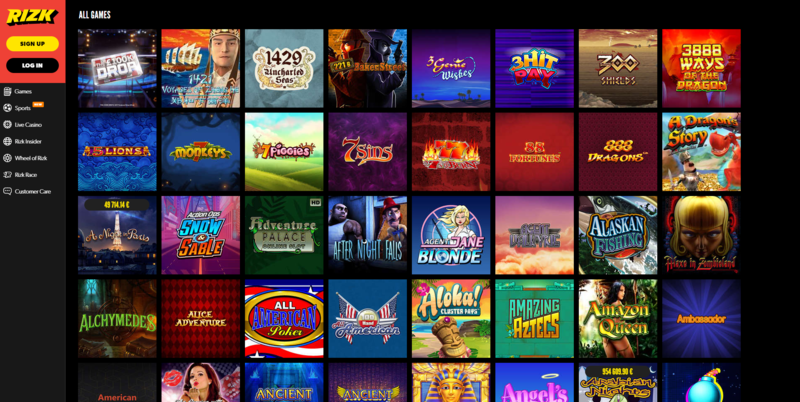 Rizk’s Live Casino have both Evolution Gaming and Netent Live available for the customer to enjoy. The Roulette offering when covered by these two companies becomes quite all encompassing with many different versions for you to enjoy. Try the new Lightning Roulette, with winnings up to 500x, the Immersive Roulette from Evolution which shows the ball falling in Slow motion for heightened excitement or Live from Dragonara Casino in Malta where you can play on the same table as people standing right there at the table. 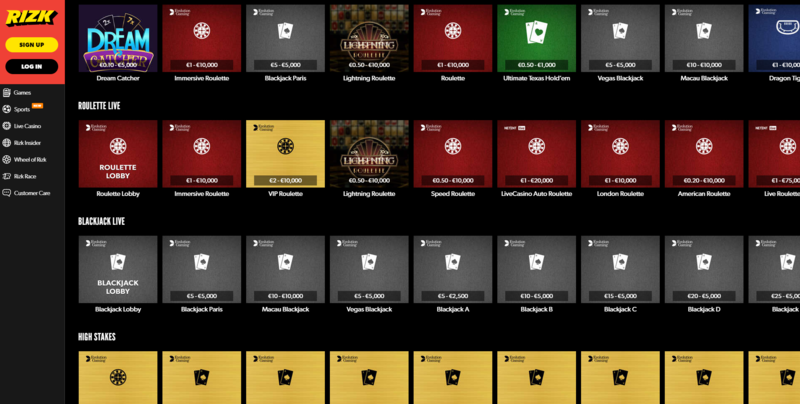 Besides the Roulette, a wide range of different Blackjack versions and VIP levels are also available as well as other great games such as Baccarat, Dream Catcher and more. Outside of the welcome promotion, Rizk has a few more things up their sleeve to keep you coming back to their establishment. First out, we have The Wheel of Rizk, where you as you level up in their loyalty system can earn Spins on the great Wheel where you can win Free Spins, Mega Spins, Cash or even a huge Jackpot! There are also other Wheels like the ExtraWheel and the Super Wheel of Rizk with higher and more extraordinary prizes. Every 10 levels you earn a spin on the Super Wheel, you don’t want to miss that. A comforting 40 points for three losses in a row. A new race starts every 30 minutes, 24 hours a day, 7 days a week. Each race runs for 25 minutes to give you a five minute break to hit the loo or get a cup of brew before you need to start spinning again in the next race. Besides the 25 min races, there are two bigger races at 7 pm and 9 pm CET every day where the prizes are higher. These run for 55 minutes to give you a chance to catch up if you are a bit late to the show. Besides the regular Races, there are often extra races for special occasions as well as Live Casino competitions and travel competitions every once in a while. 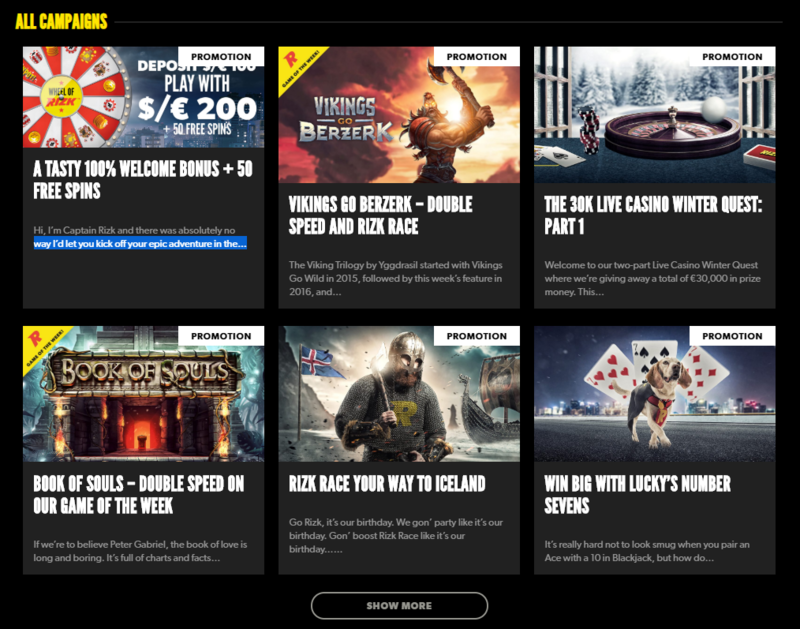 Should you want to catch up on some Casino news, they have the Rizk Insider where they explain everything from Random Number generators to keeping you updated on the latest news and Jackpot wins. A solid 4.5 out of 5 stars! Great promotions, Quick site, Cool Features, what more can you wish for? Join Captain Rizk on new adventures today!